So you’ve decided to spend a lot of money touring the country and riding roller coasters. Great! Our U.S. Amusement Park Checklist covers the top amusement parks in the United States, including their location, notability, and website. Read on for tips, and download the list at the bottom of the page. The first thing you probably want to look at is proximity. Are you willing to travel from California to Florida with two toddlers? No? Better look closer to home. Next is price. There are hundreds of websites that offer discounts on amusement parks for a number of reasons. Going during an “off” season, being in the military, etc. Heavily research current discounts before purchasing tickets to a park. Finally decide what you want out of an amusement park. If it’s just you and your friends, you might want something diverse like Seaworld, Disneyland, or Legoland. If you’re looking for a family trip, consider Knott’s Berry Farm or another place rooted in tradition and family-focused attractions. It’s also important to consider what you want out of an amusement park. Exhilarating rides? A few days of activities, shows, and sight-seeing? Fulfilling a childhood dream of meeting Peter Pan? Make sure that you’re not going to be craving some other amusement while on vacation. 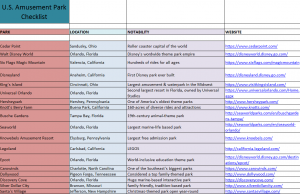 Download the U.S. Amusement Park Checklist Template.